One of my favorite things to do in November and December is to visit Downtown Lakeland with my family. We have dinner out at a downtown restaurant, browse through the stores and shop local, and stroll the streets with our fellow Lakelanders as we get into the holiday spirit. Downtown Lakeland’s November/December event line-up is changing this year, and there are more opportunities than ever to visit Downtown in the evenings to shop, stroll, eat, and enjoy the festivities. In previous years, a Christmas-oriented Holiday Walkabout was held in late November or early December. NEW this year – the Holiday Walkabouts are being moved to mid-December and a new Holiday Open House will be held on on Thursday, November 15, 2018 from 5:00pm to 8:30pm. 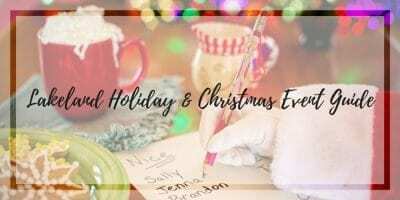 It will be a kick off to the holiday season in general and holiday shopping – rather than a specifically Christmas-oriented event. So, don’t expect Santa or Christmas lights in the park on November 15! Instead, you can start your holiday shopping on November 15, and then come back for the Holiday Walkabouts on Friday, December 14 and Friday, December 21. With so many opportunities to enjoy Downtown Lakeland this Holiday Season, we’ve got the details on ALL the events happening in November & December including merchant discounts, Santa Photos, carriage rides, Munn Park lights, Snowfest, and much more. The first annual Holiday Open House in Downtown Lakeland will be on Thursday, November 15, 2018 from 5:00 pm to 8:30 pm. Visitors can enjoy live music, face painting, and carriage rides, as well as merchant goodies, giveaways, and deals (see below for details). Text DTHOUSE to 51660 by November 14th for a chance to win a $25 gift card to your favorite Downtown business! Live Music – Billy Needs a Beard, a local band, will be playing on the corner of N. Kentucky Ave. and Bay Street. Learn more about them on their website. Face Painting – Talented face painter Heather Payne will be set up on the southwest corner of N. Kentucky Ave. and Pine St. offering pretty painted designs at a reasonable price. Carriage Rides – BFR Carriage Rides will have a rustic hay wagon drawn by two beautiful Clydesdales loading on the corner of Pine St. and N. Tennessee Ave. Rides are $1 per person. Merchant Specials – Many Downtown businesses will be open late offering discounts, deals, and refreshments. Click here to see a list of participating merchants and deals. This NEW event is a kick off to holiday shopping and the holiday season in general so don’t expect Santa or Christmas lights in the park on November 15! The holiday lights in Munn Park will be up for ALL of the other events in Downtown Lakeland in December. Coppertree Boutique & Studio at 229 N. Kentucky Ave. will be offering free sterling silver earrings with your purchase of $25 or more (limit one per customer). Also, create a Holiday Wish List–write down all of your favorite gift ideas for family and friends to see! Enjoy samples of cookies and punch. Escapology at 210 E. Pine St. will be offering $5 off per person. Use code FALL_11 at booking. Amelia Paige Boutique at 223 N. Kentucky Ave. is offering a free gift with $40 purchase (limit one per customer) and a drawing to win a free Milkhouse Candle. Fill out a wish list card so that your family can shop for you later and get you exactly what you want! Got Candy will also be set up outside the store with yummy sweets. Jesse Carl Vinyl at 304 N. Kentucky Ave., #1150, is offering 10% off when you purchase $50 or more, as well as holiday-themed snacks. Urban Appeal at 123 S. Kentucky Ave. is offering 10% off any purchase, music, snacks, and drinks. Nathan’s Men’s Store at 221 E. Main St. will be open late until 8pm. Cake Makers Studio at 115 S. Kentucky Ave. will be open late and have samples of Fall-inspired cakes and ice cream. Top Buttons at 236 N. Kentucky Ave. will be serving Rice Krispie treats and 10% off entire purchase. Take Heart at 248 N. Kentucky Ave. will offer 20% off of one regular-priced item. In addition, they will be giving away a free handmade card for a purchase of $25 or more. Satya Life at 112 E. Pine. St. will have $5 OFF coupons and a raffle for a $50 gift certificate, as well as samples of Chai Tea. Take a tour the studio, and observe yoga classes: YogaBarre from 5:15-6, New to Yoga from 6-7, and Intermediate Yoga 6:15-7:45. WonderHere at 111 S. Florida Ave. will be offering a raffle giveaway of free classes. They will also have free Indoor play and a special Fall craft for kids. Enjoy samples of Cookies and Milk. Florida Dance Theatre at 305 W. Main St. will have raffles for tickets to their annual production of The Nutcracker. They will also offer coupons and discounts for dance classes. Also enjoy candy canes and cookies. Gaines Jewelers at 112 S. Tennessee Ave. is offering 10% off any purchase up to $100 and 20% off any purchase over $100. Federal Bar Lakeland at 124 S. Tennessee Ave. will have happy hour from 4pm to 8pm. Stationery Loft at 230 N. Kentucky Ave. is giving away an ornament with the purchase of $50 or more (while supplies last) and will be having chocolate chip cookies. My Office & More at 122 E. Main St. will have yummy snacks and giveaways. Lakeland Escape Room at 308 E. Pine St. will be offering 10% off bookings in the Asylum, the Cinema or Split escape rooms. Use promo code 15Nov10off. Chop Shop at 126 S. Kentucky Ave. will have happy Hour 3 pm – 9pm with 2-4-1 Margaritas & House Wines and 1/2 off Domestic Draft Beers. Just Dance Academy of Dance and Etiquette at 124 S. Kentucky Ave. will be hosting Maria’s Expressions with their holiday gifts and knickknacks available for sale. They will also have gift wrapping (a portion of the proceeds will go to Just Cares Inc.), and free coffee and cookies! December’s First Friday event will kick off the Christmas season in Downtown Lakeland! It takes place on December 7, 2018 from 6pm to 9pm in Downtown Lakeland. The theme is Hometown Holiday, sponsored by Burnetti, P.A. Visit Santa and Mrs. Claus, and enjoy free activities, games, and live music in Munn Park. First Friday is a family-friendly event held monthly on the 1st Friday in the streets of Downtown Lakeland between Lemon Street and Oak Street along Kentucky and Tennessee Avenues. Friday, December 14, 2018 and Friday, December 21, 2018 will be the “Holiday Walkabouts” from 6pm to 9pm. Stores and shops will be open late serving up yummy goodies (like cider and cookies) and special deals, and there will be live music on the street corners. There will be the traditional holiday lights decorating Munn Park and costumed characters patrolling around for spontaneous selfies. On December 14, visitors can take pictures with Santa at Just Dance Academy on 124 S. Kentucky Ave. and participate in a Gingerbread Contest at My Office & More on 122 E. Main St. for a chance to win prizes. On December 21, visitors can take pictures with Santa at Focus Realty on 218 E. Pine Street. Walk ins welcome, and no registration required. Photos are $3. Visitors can also participate in a “Whoville Hair” and “Ugly Sweater Selfie” contest. 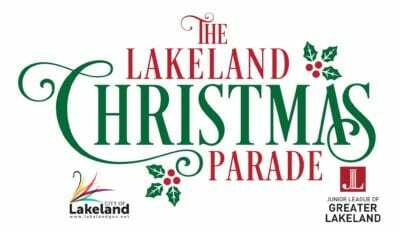 On Thursday, December 6th the 2018 Annual Lakeland Christmas Parade, sponsored by The Junior League of Greater Lakeland FL, will kick off at 7:00 pm with a fantastic fireworks display over Lake Mirror. Over 100 organizations will be participating in this year’s event! Click here to see a parade route map and learn more. There is SNOW in the forecast for Downtown Lakeland on December 8th! Join the City of Lakeland for the 38th Annual Snowfest on December 8th in Munn Park on from 10 am – 2 pm. There will be an artisan craft fair, inflatables, Snow Mountains, and Santa. Click here for prices and more details. Downtown Lakeland also hosts a variety of events throughout the year including the weekly Saturday Farmers Curb Market, monthly First Fridays, monthly Food Truck Rallies, Girls Night Out, Date Nights, and much more. Visit downtownlkld.com to learn more about year-round events, restaurants, and merchants in Downtown Lakeland. Looking for Christmas Light Displays, Special Events, Concerts & Live Performances, Parades, Santa Sightings, Holiday Movies & more? For the ultimate list of Christmas activities in Lakeland check out Lakeland’s BEST Holiday & Christmas Event Guide.